The Aryan Brotherhood (AB) originated in San Quentin prison in 1967. Originally, this gang was established to provide protection for white individuals from black and Hispanic groups, most specifically the Mexican Mafia. Some of the original members of the AB migrated from a 1950s gang known as the "Bluebirds." Other names used in the past were the "Diamond Tooth Gang" and the "Nazi Gang." Today, they number about 15,000 members in and out of prison. In March 2006, four AB leaders were indicted for numerous crimes, including murder, conspiracy, drug trafficking, and racketeering. According to the FBI, although the gang makes up less than one percent of the prison population, it is responsible for up to 26% of murders in the federal prison system. Although members of the AB ordinarily wear numerous tattoos, the true AB tattoo is a shamrock, the letters AB, and three sixes. Three sixes displayed alone are not AB-specific because they are used by several other gangs. Only members of the AB are permitted to wear the "brand" of the gang; individuals found to be wearing the tattoo without consent of the AB are subject to murder. The AB has discouraged newer members from displaying AB specific tattoos to avoid identification from law enforcement officials. As a result, some AB members have removed or disguised their tattoos. Although the Brotherhood is a white supremacist organization, for most AB members crime is their number one priority, with racial hatred being a secondary goal. The true white supremacist’s number one goal is generally racial hatred, which they may or may not achieve through criminal behavior. 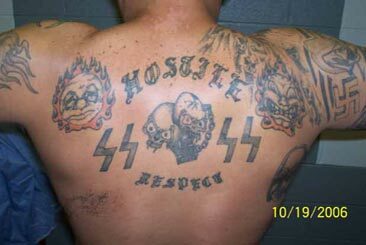 Since 1972, the Aryan Brotherhood has had an alliance with the Mexican Mafia. It has also used the Odinist religion to conduct gang meetings and disguise illicit business practices. Older AB members learned the American Sign Language to communicate covertly. The AB has spread throughout the nation and in the federal prison system. Its leadership was recently hit with a federal R.I.C.O. indictment. Although the leadership has been disrupted, law enforcement officials expect the gang to maintain a low profile and continue to contract out their criminal activity to such groups as the Nazi Low riders and Peni (Public Enemy Number One). The AB is separated into two main groups, one in the federal prison system, the other consisting of numerous factions of the Brotherhood in various state prison systems, notably California, which is loosely affiliated to a greater or lesser degree. Each faction is controlled by a three-man commission, which controls and supervises gang activities. These gangs in the state system, splinter groups or copycats, are usually tolerated by members of the federal prison or California factions, but intra-gang violence is not uncommon. Organization at lower levels varies from prison to prison. For example, in the Arizona prison system, members are known as "kindred" and organize into "families". A "council" controls the families. Kindred may recruit other members, known as "progeny", and serve as a mentor for the new recruit. Membership generally (though not exclusively) consists of white male prisoners and operates on a "blood in, blood out" system. That is, a candidate for membership must assault and kill another prisoner to enter the gang. The AB has since focused on the economic activities typical of organized crime entities, particularly drug trafficking, extortion, prostitution, and murder-for-hire. According to a recent federal indictment, the Brotherhood has partnered with Asian gangs to import heroin from Thailand. While incarcerated in Marion Federal Penitentiary in 1996, after being assaulted, Gambino crime family boss John Gotti is known to have asked Aryan Brotherhood members to murder his attacker, although the hit was unsuccessful. The overwhelming majority of Aryan Brotherhood members were originally sent to prison for crimes not motivated by racial bigotry, such as robbery, drug dealing, and assault, and join the Aryan Brotherhood out of a need for protection or camaraderie. However, members are expected to continue AB activities after being released, and are known to commit hate crimes after joining the gang. Until the 1960s, most prisons in the United States were racially segregated. As prisons began to desegregate, inmates organized along racial lines. Prosecutors of cases against the gang say it was formed in reaction to getting raped by other races in prison. The AB may have been derived from or inspired by a previous entity, the Bluebird Gang. In the early 1970s, the Aryan Brotherhood began working closely with the Mexican Mafia and began focusing on drug trafficking and other economic activities. In 1973, the California branch of the Aryan Brotherhood rejected Charles Manson when he asked them for protection against black inmates, because he had murdered a pregnant woman. The AB considered this dishonorable and turned him down initially. However, it eventually realized that Manson's followers could be exploited, so it began protecting Manson while his followers smuggled drugs and weapons into prisons. By 1980, the gang had split into two distinct factions, one within the federal prison system and one outside of state prison systems. In 1982, an anonymous source gave information to the FBI implicating the AB in two high profile murders in the California state prison system. "I will stand by my brother My brother will come before all others My life is forfeited should I fail my brother I will honor my brother in peace and war"
This group is reportedly governed by a five member steering-committee. Original members traditionally had to be at least part Irish, denoting the significance of the shamrock still worn today by members, but this tradition has waned. As testament to their commitment to white-cultural supremacy, their constitution states: "Our organization is a white supremacy group. No pretense is or will be made to the contrary." The group produced an offshoot in the 1970s called the Nazi Low Riders, which emerged in juvenile prisons under the jurisdiction of the California Youth Authority. As revealed in the recent murder trial of four AB members in July 2006, communication included codes and cryptograms, some of which involved a 400-year-old binary alphabet system invented by Sir Francis Bacon, and concealing notes in mop handles and beneath rocks in the recreation yards. Recently, new AB recruits have adopted Gaelic phrases and language, not so much motivated by codes, but by harking back to the old Celtic and Norse mythology, which is becoming more popular among newer members. They also use letters separated by happy faces combined with the strategic placement of exclamation points. After AB members Barry Mills and Tyler Bingham were convicted of murder, conspiracy and racketeering charges (some of which went back 30 years) in 2006, a federal court judge decided that the two members have a right to defend themselves and present evidence during their death sentencing hearing, a decision based on the result of Crawford vs. Washington in 2004. When attempting to document evidence for one of the alleged crimes for presentation during the members' upcoming death sentencing hearing, Assistant U.S. Attorney Stephen Wolfe found that three key witnesses had either died or vanished. The two members were convicted under the Violent Crime in Aid of Racketeering law, making them both eligible for the death penalty after ordering a race riot in a federal prison in Lewisburg, Pa. The main issue in this trial is whether the accused in death penalty cases has the right to confront his or her accuser at the sentencing hearing. Listed below are more details that make up the foundation of the Aryan Brotherhood. There will be a council consisting of (3) kindred. This council will reside where the largest concentration of family exists. The council will establish and maintain the direction of the family by receiving input from kindred and enforcing the will of the majority. All major issues will be determined by majority vote conducted by council, no minority may control the direction of the whole. The council will address all issues brought before it, including but not limited to, finances, grievances and disciplinary issues and resolve them in the light best suited to promote the goals of the family as a whole. The council will control and determine how family funds are to be utilized. Sub-councils may be established in other areas as needed for organizational purposes but must respect the direction established by the council. Any councilman may be impeached by vote. All kindred must swear their loyalty exclusively to the family, placing no thing before it in his priorities. No one shall be acknowledged as kindred until such time as he has read these laws and sworn his oath. These laws are to be known to kindred only. All kindred must conduct themselves by example at all times exemplifying the best qualities our folk have to offer; intelligence, loyalty, pride, righteousness and strength. Kindred must continually strive to promote the goals of the family no matter where they are, inactivity will not be tolerated on any level. Kindred shall assist each other in any way possible but no kindred shall exploit this generosity in any way. No kindred may act in any manner to bring shame, disgrace or contempt to him or family. No kindred may act to diminish any other kindred in his person or possession except as a lawful sanction. Kindred shall never disrespect or criticize each other in public. Kindred shall not disagree in public unless absolutely unavoidable. Kindred have a responsibility to communicate with each other in order to stay appraised of current goals and issues. No kindred shall give information/disinformation to any outsider who can be harmful to family in any way, if situation is not definite, no information shall be given at all. Baptism is the priority goal for all kinfolk. They must seek baptism at earliest opportunity; failure will result in major sanction. Until such time kinfolk are baptized they shall not be permitted to initiate progeny, hold any position of authority or vote on any matter involving major sanctions. All projects/business will be conducted on a need to know basis. No pacts or business shall be honored within the family or with outsiders unless the terms are compatible with our law. No business shall be conducted by any folk, including kindred, without contributing to the family. This contribution shall be the maximum allowable percentage of the interest, without causing bankruptcy, up to 25%. Any business financed by family funds retains 75% of the interest in that business and may pay individual(s) 25% interest to maintain that business. Kindred shall only initiate progeny to promote the goals of the family. Kindred shall initiate only (1) progeny at a time but may adopt another kindred's progeny based on location convenience. Kindred are responsible for the actions of their progeny. Abuses of this privilege will result in sanctions. Kindred must make his progeny aware of his responsibilities immediately upon birth, the progeny must commit to these responsibilities. Check out, orientate and evaluate the potential of all folk in his area. Cache toys for immediate availability to kindred. Initiate businesses or projects to stimulate capital for family. Send $25 a month to lockdown. Support kindred under any circumstance. Follow any order by any kindred. Progeny life is a minimum of (2) years. There may be a baptism prior to completion of progeny term to be applied upon successful completion of term. Upon completion of successful baptism which is directly related to family interest with sufficient immersion, consideration for progeny as kindred will be based on a demonstration of ones ability to promote the goals of the family. No kindred will be recognized except by completion of responsibilities and majority vote. Sanctions will be imposed on any kindred who fail to uphold their responsibilities. Appropriate sanctions will be determined on a case by case basis and will be applied as consistent as possible. Major sanctions will be imposed for the following: a) Treason or betrayal, b) Any act committed where a reasonable person should have known would cause substantial harm to the family.